As a Francophile, I’ll find any excuse to hop on the Eurostar to Paris for my fill of French food and wine, but sadly I can’t do this on a monthly basis. Bellanger‘s arrival, the latest offering from Corbin and King (the team behind The Wolseley, The Delauney and Brasserie Zedel) means I can now satisfy my cravings without breaking the bank. As I approached, I was momentarily distracted by the patisserie lining the windows before being transported into a chic Parisian bistro with dark wood panelling, crisp linen tablecloths and retro menus. The muted ambiance and dimmed lighting helped me unwind in my booth while waiting for my friends to arrive. Since we were all ravenous, the bread basket was devoured before I could take a pic, but the baguette was spot on, with its crunchy crust with a soft, fluffy middle. After some umming and ahhing about what to order, we started with two of the popular tarte flambées, wafer-thin flatbreads with various toppings. The Alsacienne was our favourite due to the sweet-salty combination of the lardons and onion, while the Munster and échalotes one was more subtle. The quality and flavours of our main courses didn’t disappoint either. I’m a sucker for a steak tartare, which came prepared with tiny chunks of cornichons and échalotes and topped with an egg yolk. This was one of the best versions I’ve had outside of Paris as none of the individual elements were overpowering, thus resulting in a very smooth taste and texture. The Gratin de Ravioles du Royans had all the makings of pure comfort food: spinach puree draped over ravioli and the lot covered in grilled cheese. It’s part of the hors d’oeuvres section, but there’s no way I could eat that and then tuck into a main. The grilled entrecôte steak served with béarnaise and pommes frites was cooked to rare perfection, and no complaints about veal schnitzel. For dessert, we eschewed the tarte flambées for the classics, the most impressive being the vanilla crème brulée for its sheer size, i.e. triple the amount you’d usually get! Given that I practically live for desserts, I powered my way through it, which wasn’t that hard as the filling was delicately balanced and not overwhelmingly rich and sickly. The Crèpes Suzettes à la Mode were light with a hint of orange and Grand Marnier, but it’s a shame they weren’t flambéed at the table. The petit pot au chocolat was paired with a couple of hazelnut wafer biscuits, which took the edge off the intensity of the chocolate. The Gâteau Opéra au Café was the daintiest dish and rounded off the meal nicely. 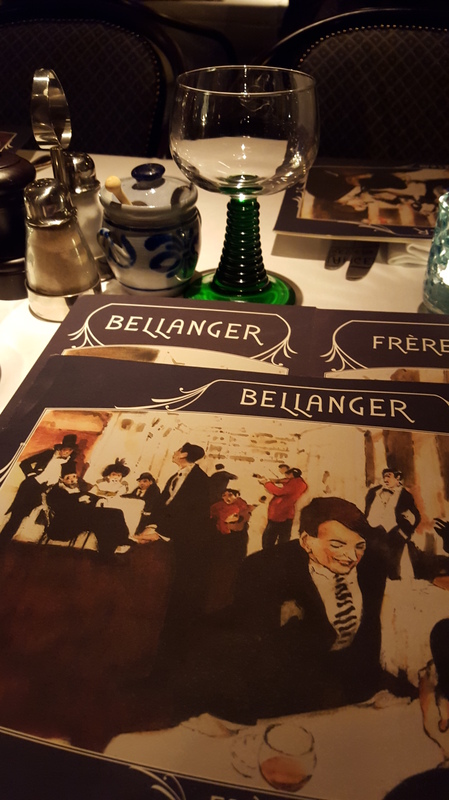 If French cuisine is your thing, then dining at Bellanger is a must for its sophisticated interior, classic food and France-centric wine list (we had Fitou ‘Origines’ 2013, Bertrand-Bergé, Languedoc). The only issue for me was some aspects of the service, e.g. repeatedly asking if I’d finished my dish and mixing up the cutlery for the main course. This aside, we had a brilliant evening and can’t wait to try some of the other tempting choices. Budget: £53 pp (3 starters, 3 mains, 4 desserts, 2 bottles of wine & 12.5% service).